In late 1936, after the successful invasion of Abyssinia, Amedeo returned to the Italian colony of Libya with his unit. The governor was the mercurial Italo Balbo, former hard-line Blackshirt street-fighter, founder of the then well respected Italian air force, the Regia Aeronautica, heroic transatlantic aviator – Avenue Balbo is still named after him in Chicago –and the only Fascist leader who could rival Mussolini in terms of ability and popular appeal. Mussolini had removed Balbo as head of the air force and had hoped to marginalise him by making him governor of Libya. Balbo, however, governed with panache and ability, and was seldom off centre-stage. 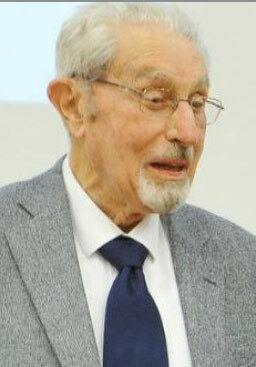 As his street-fighting past receded, he became a moderating voice in the regime, deploring the German alliance, publicly arguing against the anti-semitic Race Laws and vehemently opposing the declaration of war in May 1940. Balbo was a long-standing family friend of the Guillets – more accurately, his wife was – and Amedeo became his protégé. Particularly after the Spanish Civil War, in which Amedeo served, Balbo would share his private despair about the course of Italian and European politics. It was never an equal relationship, but it was close. It was a tragedy for Italy that Balbo was killed by friendly anti-aircraft fire over Tobruk in the first fortnight of Italy’s entry into the Second Word War. Had he survived, the skids might have been put under the Duce even sooner and the bungling Italian armistice of 1943 avoided. Italo Balbo, with his black goatee beard – much favoured by the Alpini with whom Balbo served in World War One – awards Amedeo the Bronze Medal for his efforts in the conquest of Ethiopia, Tripoli late 1936. Amedeo in crisp white colonial uniform awaits his turn to receive his decoration with other officers. In March 1937, the Duce decided to visit the Italian colony of Libya – the addition of which to the Italian empire in 1911 Mussolini had strongly opposed as a young socialist firebrand. Here he and Balbo (left) receive the choreographed acclamation of the locals, whose highlight was to sing the Fascist hymn Giovinezza in Arabic. Amedeo had a key role in the Duce’s visit: to organise the equestrian element of the “Sword of Islam” ceremony in which the Duce – uninvited – proclaimed himself defender of the world’s moslems. All the Fascist gerarchi were to ride into Tripoli on horseback at night, with fireworks and bands announcing their arrival. Many of them could not ride. Amedeo had been sent to Europe to buy the horses and train them for the occasion. 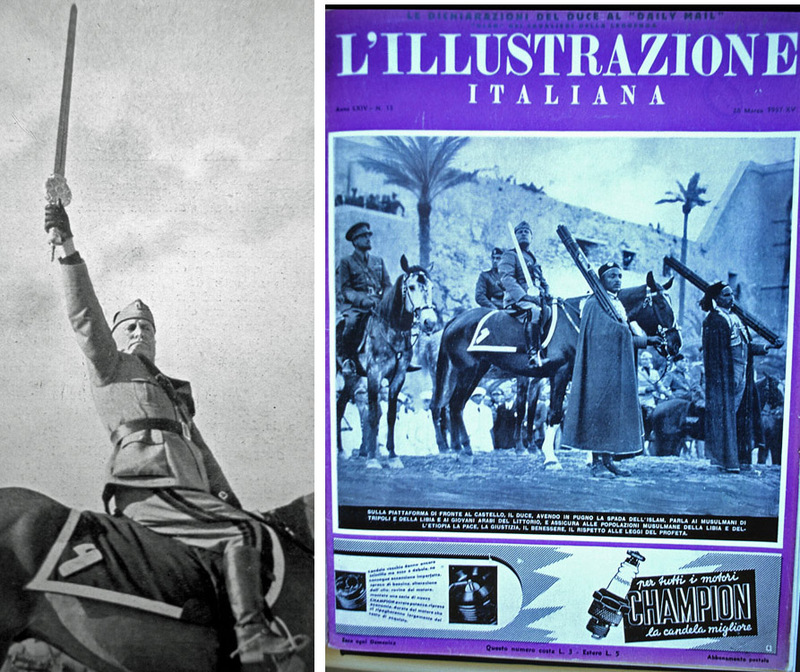 Mussolini sits on his elephantine warmblood horse holding the sword, and Balbo, on the grey, makes sure he is not out of the shot. Amedeo had bought the horse in Germany for the occasion, and had trained it to cope with sight of camels and other novelties. After Rome was liberated in 1945, he saw the horse again in the stables at Tor di Quinto. It had been requisitioned by an American admiral, who eventually shipped it to the States as a trophy of war. The “Sword of Islam”, which was actually made in Florence, is unsheathed and it makes the front pages. In fact, the closing ceremony was marred for the Duce by news of the Italian army being routed at Guadalajara by the Spanish Republican International Brigade. Amedeo was peeved by my irreverent treatment of the Sword of Islam ceremony in the book, as he was proud of what he had achieved with the horses. It was a wonderful spectacle and made lots of headlines, and the question of what it all meant, beyond telling Britain and France that there was another power in the Middle East, bothered no one at all. Just wanted to share an amazing story my dad kept from all of us for so many years. My dad who is the staff Sergeant mentioned in the Provenance below, kept all of this secret even to me until a few years ago. My dad received the silver star at Anzio, but never really spoke about this until he knew he was going to pass away, and that’s what happened dad passed last year.He told me he was concerned about the Italian Government taking these artifacts away, so he kept all of this secret. (( The Black Blanket is the exact same saddle blankets Italo Balbo is sitting on next to Mussolini with the sword of Islam in 1937, Governor Balbo)) (fascist puppet of Mussolini) is sitting on his Gray Horse; the first picture on the attachment above. Dad had everything professionally researched in Las Vegas, Everything is Notarized and documented and provided to secure the provenance below. Description: Very rare textile (felt with linen backing) horse saddle blanket, (BLACK and RED) belonging to Benito Amilcare Andrea Mussolini (ll Duce) b. 29 July 1883 – d. 28 April 1945. Bearing hand stitched bullion thread Italian Eagle and The National Fascist Party (Partito Nazionale Fascista) insignia, with leather panels and a decorative Bullion threaded ribbon border. Blanket was acquired from King Victor Emmanuel III Palace, (Palazzo Pitti) Italy, during World War II by American liberators. Mussolini would use these during parades and also were used by his generals and even can be seen being used by Italo Balbo, Governor of Libya, during Mussolini’s occupation of Libya in Tripoli/Libya, March 1937. Provenance: American liberator, Staff Sergeant of the US 5th Army, 3rd division in WWII. Departing on the USS Transport “Rutledge”, his division landed at Fedhala Bay French Morocco in November 8, 1942. Invading Italy through Salerno. The company entered into King Victor Emmanuel III Palace in September 1943. Blankets, tapestries, and tablecloths were acquired by the soldiers after Mussolini abandoned & fled because of the swift invasion by these GI”s. In 1944 The items were secured at Anzio in farm storage and shipped back to the United States, where they have remained packed away for 70 years. Blanket measures approximately 28.5″ x 58″. Truly a once-in-a-lifetime opportunity to own a piece of history. © 2010 The 'man on the white horse'. All Rights Reserved. Greyzed Theme created by The Forge Web Creations. Powered by WordPress.